Millions of people up and down the country and counting down the minutes to the England vs Italy game tonight, kicking off at 11pm English time in Brazil. 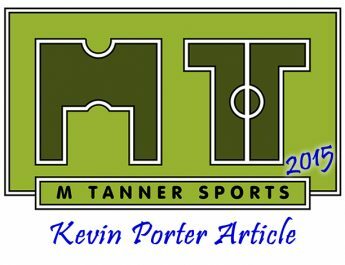 So you may be wondering why M Tanner Sports hasn’t been writing more about the World Cup already? Quite simply there is so much written about it so far, and continuing for the next few weeks; you can read better reports elsewhere. The one aspect of the World Cup that excites us here is the buzz and the coming together of people. Already you can see the car flags, which came out in the mid-2000s, fluttering from many a car and taxi around your area. Then there are the flags hanging from windows and up in offices. Now some people will be fearful of hanging a flag or even wearing their shirt out in public but it really shouldn’t be this way. Every nationality should be proud of where they come from and should be allowed to wear their colours with pride, especially in this global village we live in. Football is no longer the violent animal is once was in England in the 1980s and will hopefully never resort back to this. M Tanner Sports is proud to be based in England and will be cheering on the lads, unfortunately from the comfort of the living room and not out in Brazil. I hope the Italian fans in England can watch the game in peace in pubs and halls up and down the country and that this game will bring people together rather than incite beer fuelled fights which could result in a new generation of football fans is lost because “it’s not safe to go and watch the football”. Equally to all those people who ‘hate the hype’, it only comes around once every four years! The positivity it creates far out weights the negatives that it could bring. People this week have been generally a lot happier in the sunshine with everyone looking forward to one common goal, watching the games. There was a lot written about the poverty in Brazil in the build up to this tournament and the class divides in general in South America. However this is good that the World Cup has highlighted this again to mainstream media as otherwise it would still be untold. The finance coming in to Brazil will be massive and even if a small proportion of this gets to the people that need it then that’s something. I’m sure charities will see an increase in donations during these new few weeks too. Showing our age here, or lack of it, the first World Cup that caught our imagination and started a long love of the game was the World Cup 1998. This World Cup in 2014 will stir a new generation into recreating the best goals of the tournament for the rest of the summer. These young viewers are the next season ticket holders of their local club and if this tournament can pass with little trouble in sleepy suburban satellite towns in England then maybe attendances all over the country will start to rise again. This is where clubs in England need to come up with smart marketing schemes to get this next generation in to watching regular live football again. It amazes us how many parents still think football fans hop on the coach to say Basingstoke in a Conference game drinking the whole way and starting fights; this is so far from the truth. There are school teachers, doctors, civil servants and retail workers all getting on talking about football for the day and leaving behind their weekday worries. There are of course still a small minority that are intent of ruining the day for others when the away team rolls into town but they are definitely on the decline and often laughed away by true football fans. Our advice for any England fans or any other fans of the World Cup is to enjoy these next few weeks and please carry on your love for the game beyond the summer months. Many teams are sculpting their squads for next season and thinking up new ways to entertain their crowds for the 2014/15 season. So take your son/daughter or just yourself, along to a local game when pre-season starts and give watching live football a try. Many of your local non-league clubs will really appreciate your support and you’ll be making a real difference in keeping your home team going. Best of luck to Roy and the boys in Brazil tonight, hope you can keep the nation entertained past the group stages!